Is Our Solar System Missing a Giant Planet? Mystery Planet: Is a Rogue Giant Orbiting Our Sun? It wasn't just asteroids that got flung around, however: a paper just published in the Astrophysical Journal Letters argues that the young solar system started out not with four giant planets but five. 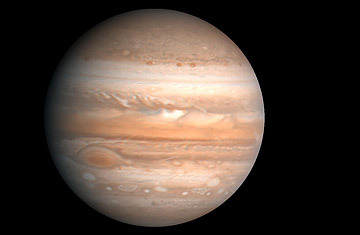 Once upon a time, says lead author David Nesvorny, of the Southwest Research Institute in Boulder, Colo., Jupiter, Saturn, Uranus and Neptune had another sibling. But that fifth giant, perhaps as big as Neptune, perhaps only half that size, went too close to Jupiter  or Jupiter went close to it  and the nameless world was whipped out into space at a screaming 200,000 m.p.h. (322,000 km/h) or so. "After 4 billion years," says Nesvorny, in a masterpiece of understatement, "it's probably pretty far away." The evidence for this long-departed planet comes out of complex computer simulations that try to reproduce the solar system as it used to be. To qualify as plausible, such a model has to set up the conditions that could evolve into the configuration we see today. That means all the planets have to wind up in the right places, as does the Kuiper Belt of comet-like objects out beyond Neptune, and as does a second, bigger bunch of comets  the Oort Cloud  that stretches a good fraction of the way to Proxima Centauri, the nearest star. In 2005, a group of planetary astronomers came up with an idea that worked pretty well: the so-called Nice model (it was named not for its pleasant attributes, but for the French city of Nice, where most of the scientists were based). According to the Nice model, the four familiar giant planets were originally bunched up much closer than they are now. Thanks to millions of small encounters with comets and asteroids, and a few bigger ones with each other, Jupiter ended up moving inward, the other three moved out, the Late Heavy Bombardment happened on schedule, and the Oort Cloud and Kuiper Belt took shape just right. At least that's the way it worked some of the times the model was run. To be really successful, however, a solar system model has to come up with the right answer over and over again, and when Nesvorny ran his own version of the simulation, it ended up throwing one of the four giant planets out into space. Or else it disrupted the inner planets, so Mars and Earth destroyed each other in a cosmic crash. Not ideal. One idea that had been floating around (so to speak) among planetary scientists, however, was the idea of the long-lost fifth giant planet, bunched up with the other four. "This result was not out of the blue sky," Nesvorny says. "Some of my colleagues even mentioned it in passing in the papers they published." Nesvorny added the fifth planet to his simulations  and it worked. More often than not, just as predicted, the extra planet was thrown into the void, a Neptune-size sacrificial lamb that changed things enough to keep Earth safe. If it happened here, of course, it could happen in other solar systems  and in fact, a report last spring claimed the fleeting detection of 10 rogue Jupiters wandering through the depths of the Milky Way. "There's nothing physically mysterious about this," David Stevenson, a Caltech astronomer, told TIME in May. "It's a perfectly natural outcome." It's so natural, in fact, that Stevenson himself made an even more audacious proposition more than a decade ago. The smaller the planet, the easier it is to fling into deep space, so a planet with the mass of Earth could be catapulted out with little gravitational effort at all. The real planet Earth wouldn't fare well in the frigid darkness between the stars. But, says Stevenson, it's plausible that some Earths could be more like mini-Jupiters, with a thick atmosphere of mostly hydrogen. "Hydrogen," he says, "is well-known to be a greenhouse gas." On Earth, greenhouse gases trap the heat that flows in from the sun. In interstellar space, there is no solar heat. But there would still be heat rising from inside the planet, the result of radioactive minerals deep underground. "A hydrogen atmosphere," Stevenson says, "would trap that heat very efficiently." The result: while the top of the atmosphere would plunge to hundreds of degrees below zero, the surface would warm enough to keep water in liquid form. Since water is essential to life, it's not impossible that such a vagabond Earth could harbor organisms  even intelligent life, as long as it could handle the noxious air. And since there are so many billions of stars in the Milky Way, there could be at least millions of these nicely insulated planets. Astronomers currently assume that their best bet for finding life in the universe is to look for an earthlike planet basking in the light of its parent star. Maybe they should be looking into the darkness instead. Read about the birth of our watery solar system. See whether we are a nine-planet solar system once more.